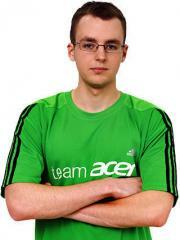 Artur "Nerchio" Bloch is a Polish StarCraft II player. Nerchio is currently ranked #240 in highest overall earnings, and #6 in highest earnings for players from Poland. The most money that Nerchio has won from a single tournament was $16,000.00 from DreamHack Valencia 2016 (SC2) on July 16, 2016. He placed 1st, making up 4.36% of his total prize money won. On December 16, 2012, Nerchio arrived at the $100,000 milestone, winning $1,032.86 and placing 1st at EPS Poland Season V (SC2). Prize money from 120 tournaments got him to that point. In the last 90 days, Nerchio has won $600.00 in cash prizes from a single tournament, none of which came in the last month.